Reading and share top 15 famous quotes and sayings about Living Life Happy by famous authors and people. 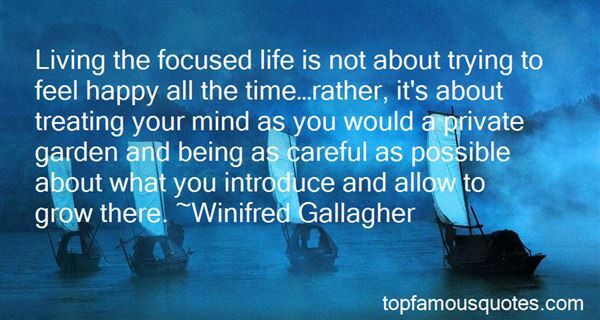 Browse top 15 famous quotes and sayings about Living Life Happy by most favorite authors. 1. 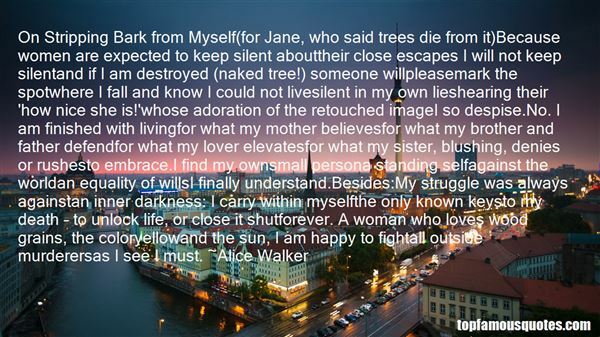 "On Stripping Bark from Myself(for Jane, who said trees die from it)Because women are expected to keep silent abouttheir close escapes I will not keep silentand if I am destroyed (naked tree!) someone willpleasemark the spotwhere I fall and know I could not livesilent in my own lieshearing their 'how nice she is! 'whose adoration of the retouched imageI so despise.No. I am finished with livingfor what my mother believesfor what my brother and father defendfor what my lover elevatesfor what my sister, blushing, denies or rushesto embrace.I find my ownsmall persona standing selfagainst the worldan equality of willsI finally understand.Besides:My struggle was always againstan inner darkness: I carry within myselfthe only known keysto my death – to unlock life, or close it shutforever. A woman who loves wood grains, the coloryellowand the sun, I am happy to fightall outside murderersas I see I must." 2. 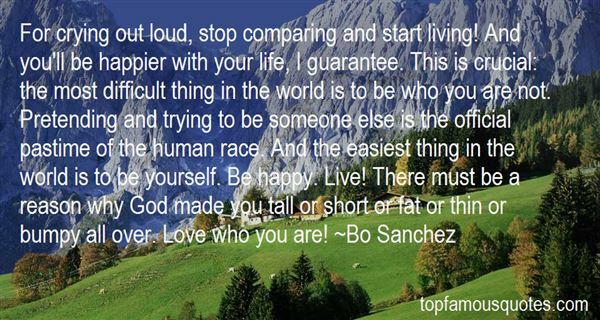 "For crying out loud, stop comparing and start living! And you'll be happier with your life, I guarantee. This is crucial: the most difficult thing in the world is to be who you are not. Pretending and trying to be someone else is the official pastime of the human race. And the easiest thing in the world is to be yourself. Be happy. Live! There must be a reason why God made you tall or short or fat or thin or bumpy all over. Love who you are!" 3. "The interesting (and sometimes scary) thing about living a purposeful life is you begin to realize that, in a very real way, your life is not your own. You're not here to just get all the good stuff for yourself — and maybe your loved ones — so you can live a happy, pleasure-filled existence. You are part of a larger organism, a larger system, and all the good that you receive, all the talent you possess, everything that you have, is not for your benefit only — but for the benefit of the whole system. And the more you surrender to this, the more the universe will pour its bounty through you so you can be a bigger giver." 4. "No matter what it looks like or seems like. There is hope at the end of the tunnel. Think smart and plan for your future. Your words are power. Your thoughts are dynamite and your life can make a major difference for someone else. You are above and not beneath. You are the head and not the tail. See hope in everything that you do because you are filled with major purpose. Giving up is not an option and living life to the fullest is a major choice. Choose to be happy! Live for tomorrow." 5. "Only those are happy who never think or, rather, who only think about life's bare necessities, and to think about such things means not to think at all. True thinking resembles a demon who muddies the spring of life or a sickness which corrupts its roots. To think all the time, to raise questions, to doubt your own destiny, to feel the weariness of living, to be worn out to the point of exhaustion by thoughts and life, to leave behind you, as symbols of your life's drama, a trail of smoke and blood - all this means you are so unhappy that reflection and thinking appear as a curse causing a violent revulsion in you." 6. "Most people's reality is an illusion, a great big illusion. You automatically have to succumb to the illusion that 'I am this body'. I am not George. I am not really George. I am this living thing that goes on, always has been, always will be, but at this time I happen to be in 'this' body. The body has changed; was a baby, was a young man, will soon be an old man, and I'll be dead. The physical body will pass but this bit in the middle, that's the only reality. All the rest is the illusion, so to say that somebody thinks we are, the ex-Beatles are removed from reality in their personal concept. It does not have any truth to it just because somebody thinks it. They are the concepts which become layer upon layer of illusion. Why live in the darkness all your life? Why, if you are unhappy, if you are having a miserable time, why not just look at it. Why are you in the darkness? Look for the light. The light is within. That is the big message"
7. "For years, i lived my life, waiting for the other shoe to drop... i thought control was something i could have over my life. My goal was to live life, in such a way, that i would never again have to suffer any form of trauma or abuse that would remind me of my painful past. I was living life on a tightrope of tension. I was only happy when things went smoothly and came apart at the seams when i was thrown a curveball.NOW, i realize, that the key to happiness is surrendering to the illusion of control. And to trust that, no matter what happens to me, i have the infinite inner-wisdom and strength to find my way through." 8. "So I let my shame own me, kill me, wilt me away into a thousand dead flakes, knowing if I kept it all in, she would never have to learn the dirtiness that was forever inside me--the bad, the ugly, the twisted. She could go on living her life happy, just like she deserved." 9. "A life without an objective is much like a ship at sea with no port in mind. It drifts with the waves or storms, or with the whim of the captain. They are tempted to ask, amidst the battles of life, "Is the struggle worth-while?" That attitude lessens the joy of living. They who say that there is no purpose in life are not unhappy, but become dangerous to themselves and others, for they have no safe guide for their actions. Indeed, life has not objective save physical satisfactions, it is empty and valueless." 10. "I did not wish to live what was not life, living is so dear." ThoreauMarriage, bearing children, divorce, single parenting, work: all had confronted me with certain essential facts of life. I wasn't even unhappy. The fact is, living (somewhat) consciously, like eating wonderful food, had given me more rather than less of an appetite. I had found living so dear that I wanted to do it full time." 11. "It was as if he'd suddenly become intimately aware of the fragility of life and how precious time really was. As a result, he made a conscious effort to simplify his life, with the goal of eliminating unnecessary stress. No longer interested in society's definition of success, he began purging his life of material things. Life, he decided, was for living, not for having, and he wanted to experience every moment that he could. At the deepest level, he'd come to understand that life could end at any moment, and it was better to be be happy than busy." 12. "I found that even when a situation seems dreadful or impossible to comprehend, it is an experience, and being present in the experiences, rather than removing myself and running away, is part of living a fulfilled life. Complaining keeps us from connecting to our true self and keeps us in the shadows of life. Feeling life is the connection to being happy." 13. "Unlike him I had been unable to escape into the simple complexities of science. All he had to do was solve the mystery of the universe, which may be difficult but is not as difficult as living an ordinary life...(How happy scientists are! Why didn't we become scientists, Percival? They confront problems which can be solved. We don't know what we confront. Does it have a name?)" 14. "Living the focused life is not about trying to feel happy all the time…rather, it's about treating your mind as you would a private garden and being as careful as possible about what you introduce and allow to grow there." 15. "Well we've left behind the 200X's, and we move onto the 20XX's. Maybe that will finally make us feel like we're living in the future, rather than a media controlled slave state where an iPhone is worth substantially more than a human life. Happy new year." I had flops, I had success."